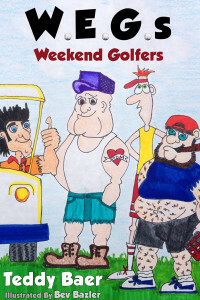 Weekend Golfers (W.E.G.s) by Teddy Baer is a humorous take on golfing. Columbus Publishing Lab produced W.E.G.s under our Proving Press imprint in spring of 2014. Ted chose our Isotope Package, and added cover design services to give his book a professional exterior. W.E.G.s was expertly formatted for both print and e-book markets. We made sure the interior text was not only readable, but ready for the printer and all major e-book markets. The book’s full-color illustrations were edited for maximum vibrancy and effect. Ted already had cover artwork in mind, and our team of designers worked with his provided image to create a quality book cover. We professionally sized and edited the artwork, and laid custom type to fit the aesthetic of the book. All of our publishing packages come with distribution. Authors like Ted who distribute through Columbus Publishing Lab set their own list price and the discount (wholesale price). Ted’s book is available through Amazon.com, Barnes & Noble Nook, and Kobo. He doesn’t have to worry about stocking, managing orders or shipping. We handle everything so our authors can focus on writing (or golfing 🙂 ). Check out W.E.G.s by Teddy Baer here! Throughout Ted’s entire publishing process he had a dedicated point of contact. Every author that self-publishes through Columbus Publishing Lab receives personal service from a real, live person. We genuinely care whether your book succeeds, and we’ll do everything we can to make the self-publishing process easy and enjoyable. We’d love to discuss your book project. Whether you’re interested in a complete package, or one of our many à la carte services, we’re happy to answer your questions and get started right away.